Can you please tell us how to add in your reasources with no main.lua from you?? You can take everything from the git. It doesn't need main.lua as I still didn't modified it, the one from your project will work with. The only thing is you need to declare all ressources in project.db. 1.) Thanks! 2.) I did it on RoTH SE dev and the game did not boot up... Help! Is there any message ? Send the error.txt, but if you tried to copy anything from my project that is not present / declared in the ROTHSE project, it will not work. Okay, so far, progress since the begining of 2016 are quite satisfying. The Day and Night Cycle has been implemented in the game, the source code will be available when the technical demo will be released. It include a 7 days system so side quests and some events will be dispatched in the week. The Picture above show the current state of the HUD, which now only miss the Minimap System. It will also be released with the technical demo. Before it's release, you can see how it works in game here. Okay, so the Engine is now doing what I wanted since the begining. I have enough ressources to make the 1st demo and now my work will mostly be focused on making the game. What have been changed ? - Everything works as I wanted since I started working on the game : That is, hero voices, custom gameplay, menues, cutscenes have been successfully implemented and works as I wanted. 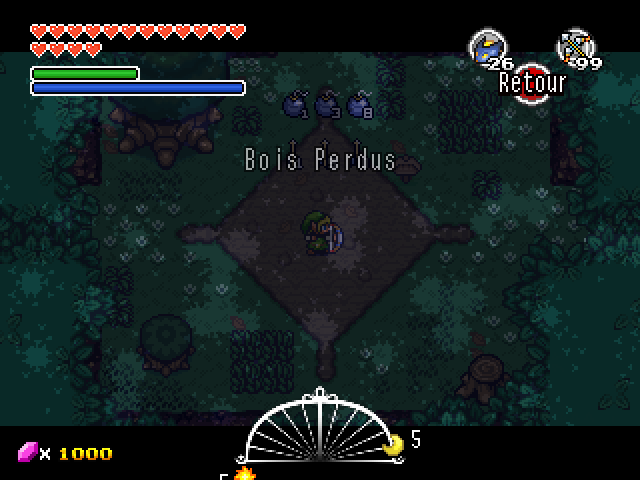 - Hero Mode has been implemented in the game : It consist of a very challenging mode, no hearts or fairies are obtainable through destructibles, enemies does 2 times more damage then the usual, Link's attack are twice less powerful then usual, that is, regular enemies takes a lot more hit to be killed. - Dynamic music has been implemented in the game. It works like Twilight Princess (and it is based on). That means, the music changes when the environment surrounding the player changes. This is just looking better and better - I'm really impressed! If you can wait, I would recommend not doing too many cutscenes until 1.5 is released. The new camera as an entity functionality will make cutscenes easier to code and look better. Update : Roc's cape is finally implemented with it's own controllable jump system, a bit close to Minish Cap (though I cannot replicate at 100% the movement system, too complex. With this come the Down Thrust sword skill. This project seems to be coming along beautifully, I look forwards to when this is finished. and see if I could use it in a Majora's Mask like game. Overall, I just like the general look of the game. This signature was way too long before, but now it's short! Also, I am Still Alive! On ad Off I go! Do you ever get the feeling that the fandom of a product(s) ruin the potential that you could have had to enjoy the product? Yes, you can take the day/night system, you might need to modify some things and initialize default values to fit your project (hours, minutes, day and place where tones occurs), you can modify it as well, but it is a very "basic" and early day/night system, I am currently updating it mostly because I want the script to be only 2 scripts and to fix some issues (the tone system and the hud clock), and not dispatched in 4 other scripts like it is currently, which might be a nightmare for other users to understand). You can check my github, the script is in /scripts/hud/day_night_clock, /scripts/gameplay/tone_system, and you need some function in game_manager and quest_manager, yes, it has many script depencies, but I will take all these depencies away soon.